This was a stupid idea when it started - it still is. 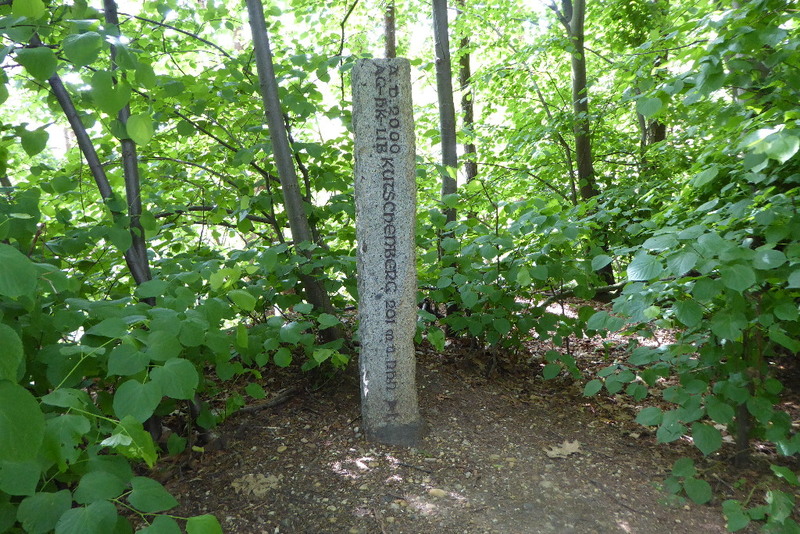 At some point, while walking around in a forest in the south-east of Berlin, I came upon a marker denoting that this was the highest mountain in Berlin (the "Großer Müggelberg" at 114,8 meters). 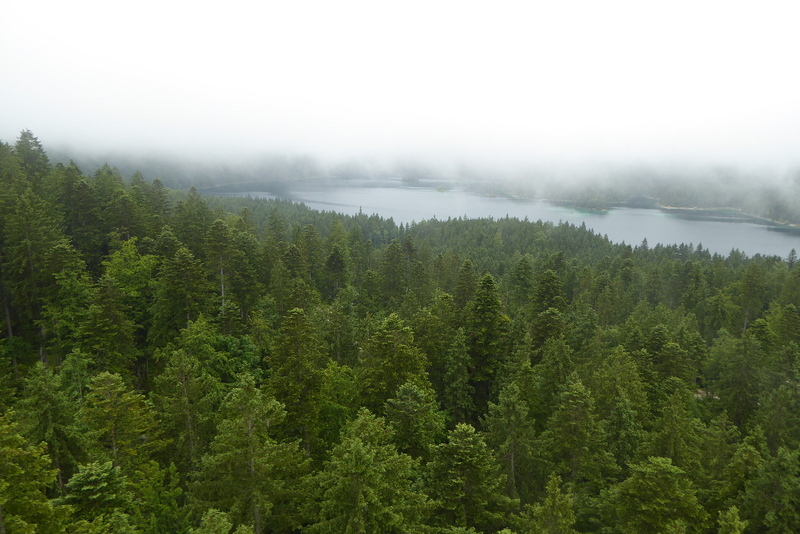 It hardly qualifies as a mountain and it's in the middle of a forest, so you don't even have a view. 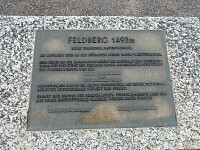 But at that point, ignoring broadcast towers and various other buildings, it's was the highest peak in Berlin. 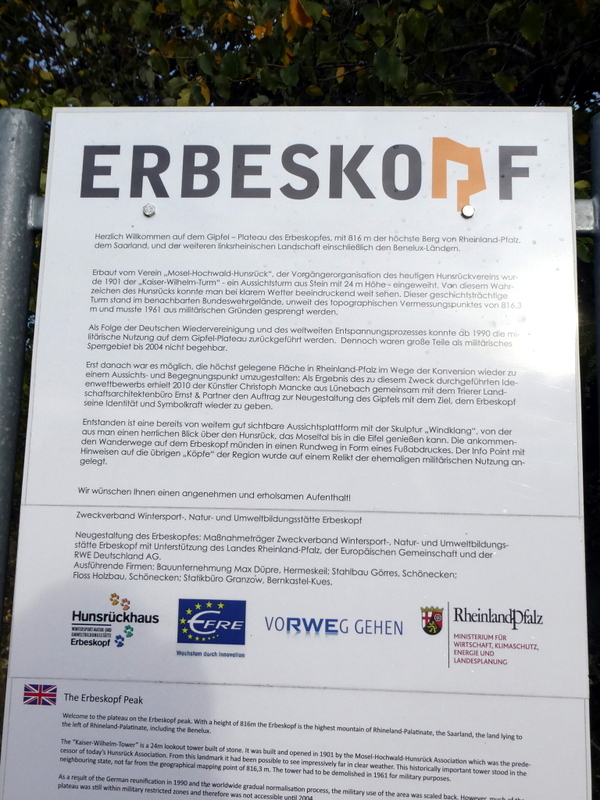 Two years later, a another company that piles up rubble from demolished buildings had put up enough of that in Pankow to create the "Arkenberge" and make them 120.7 meters high - creating a new 'highest peak'. 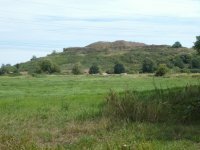 But then, "Teufelsberg" und "Arkenberge" are artificial (essentially both are landscaped rubble dumps), while the "Großer Müggelberg" is a natural peak. 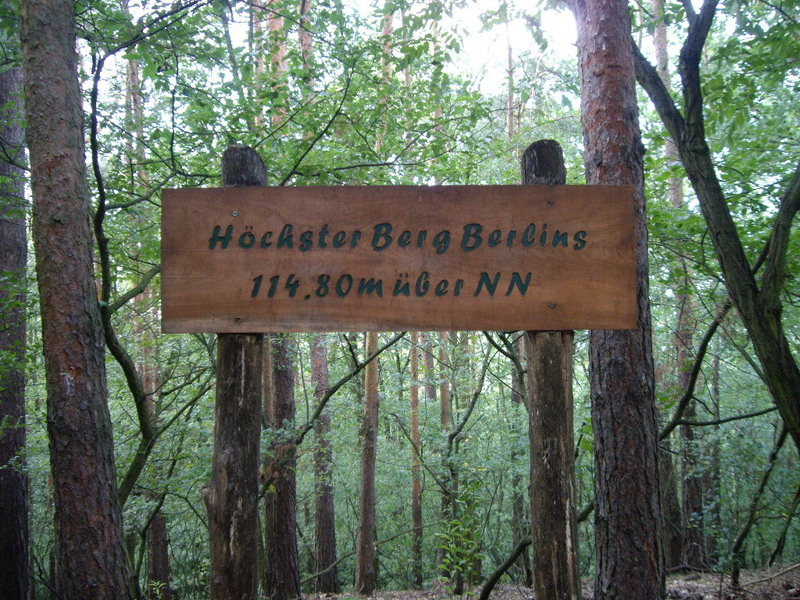 (Which is now reflected by the sign on top of it, which used to say "Highest Peak of Berlin" and is now replaced by one that claims "Highest Natural Peak of Berlin". 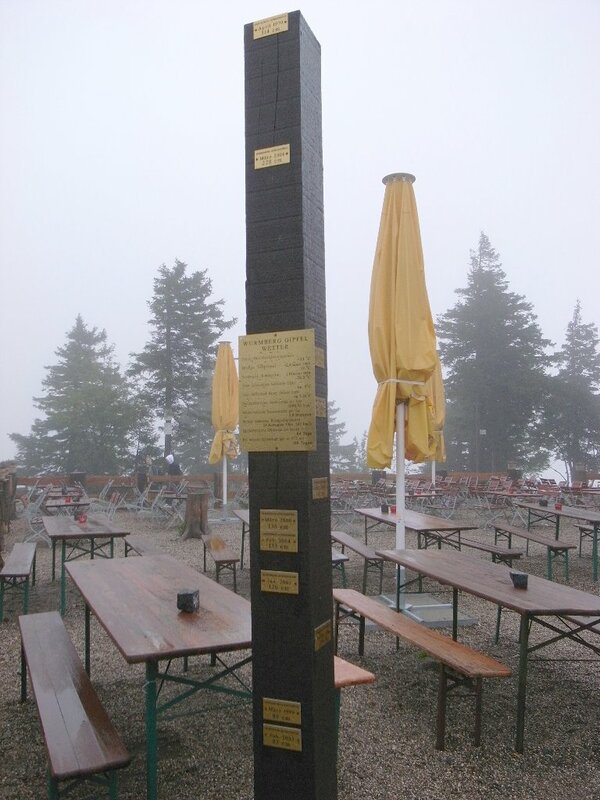 The basic point being - the concept of a 'highest summit' in Berlin is an arbitrary one. Although that is true for many 'highest' superlatives. Does the highest point of a building count? Or just the 'Architectural Top' (which excludes masts and antennas)? 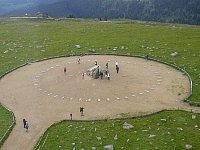 'The highest accessible point? The highest occupied floor? Do towers count? Or just 'buildings' (with at least half of the height being habitable)? 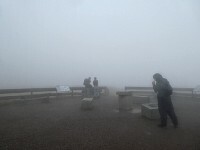 So it's no wonder that even something like the 'highest peak in Berlin' is a somewhat debatable concept. More relevant is that some years ago I didn't have any 'proper' travelling scheduled for a couple of months during summer. So I looked for something to keep me from sitting at home. I decided to rent a car for the weekend and just drive to - somewhere. For now special reason except for "Why not?" and "I've never been there", I decided to drive Magdeburg. 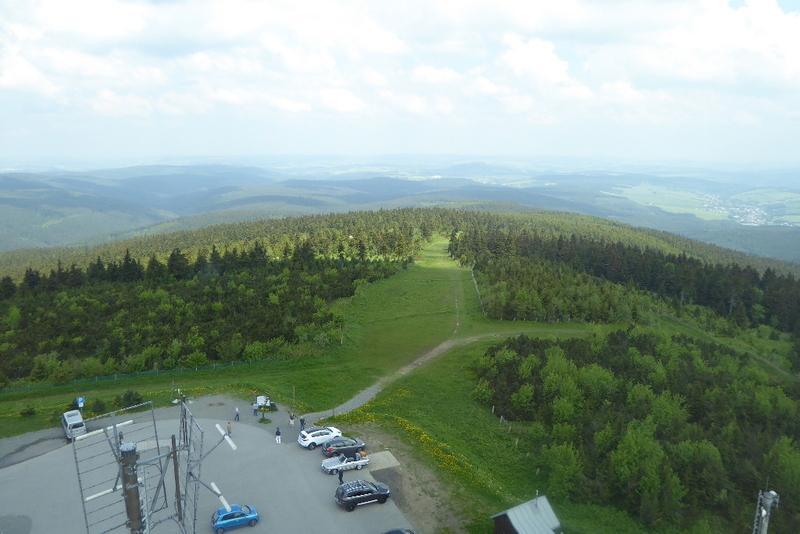 And as that hardly fills a weekend, I also went to the "Brocken", which is the highest mountain in the "Harz" area. 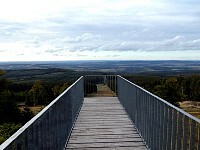 And the highest peak in Sachsen-Anhalt. 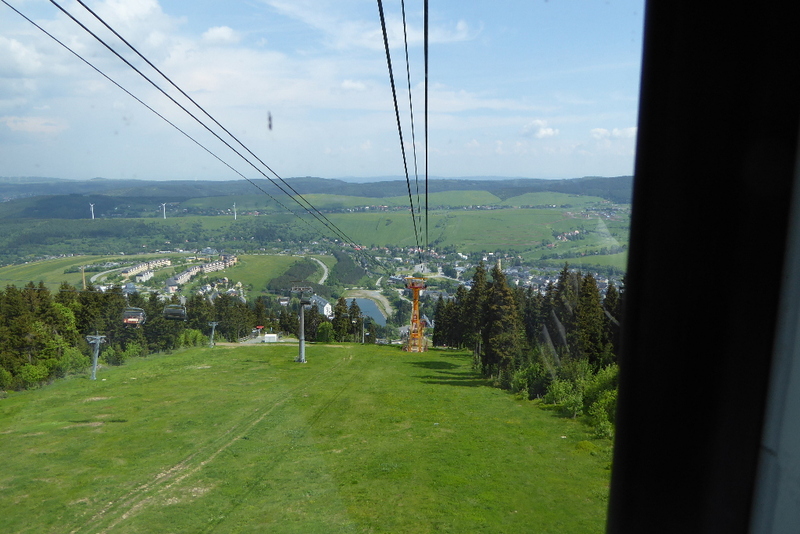 And only a few kilometers away, there's the "Wurmberg", which happens to be the highest mountain in Niedersachsen. 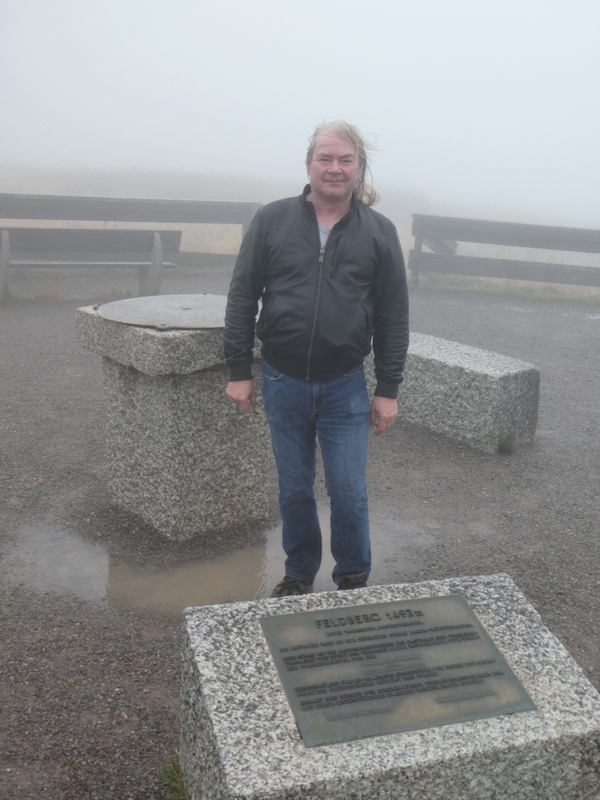 So, together with Berlin, I had visited the highest peaks of three German states. But when I had no real travel plans the next summer, I rented a car again and looked for some place to go. Again, I had no reason to go anywhere specific - just some place I could drive to and where I hadn't been before. So why not look for some other peak to travel to? 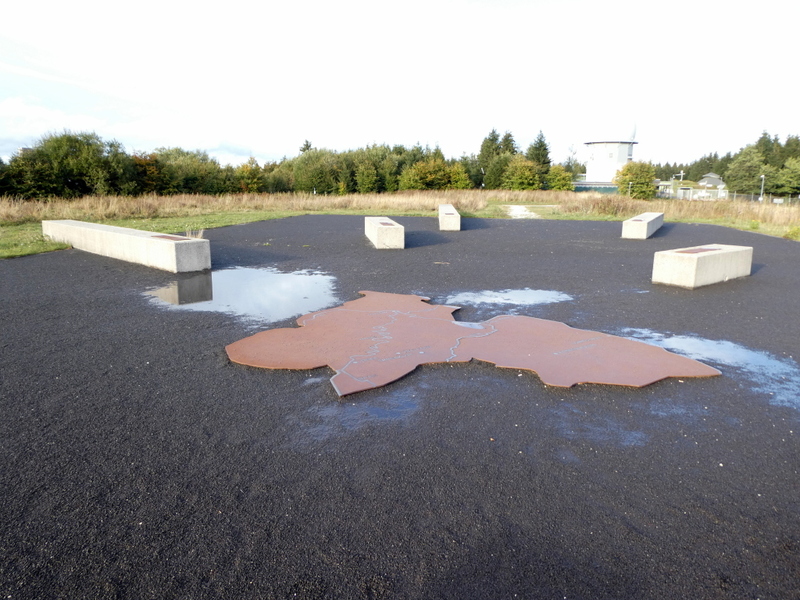 The closest one to Berlin (excluding the ones in Berlin itself) is at "Helpter Berge" in Mecklenburg-Vorpommern. So I drove there. 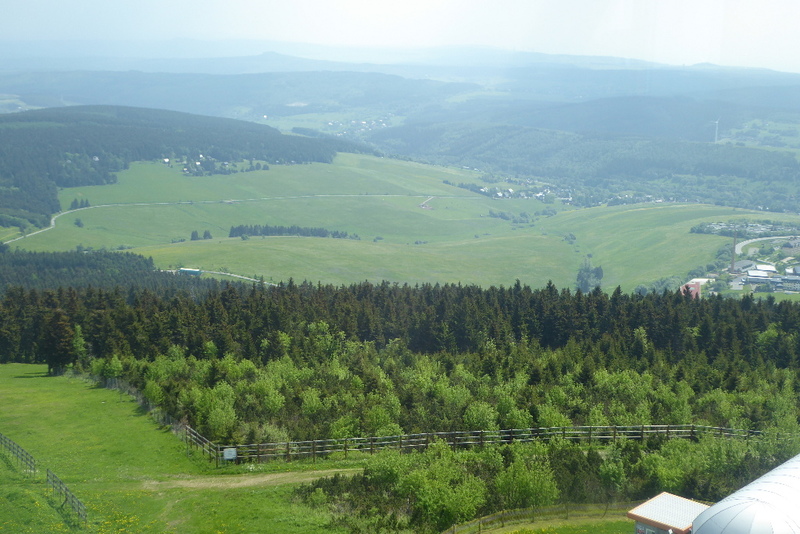 So when a similar situation arose in 2016, I rented a car and set out for the highest point (and peak) in Brandenburg and the highest peak in Sachsen. The whole thing was getting a bit silly. But not worse than visiting cities by size or alphabetical order. Or by throwing darts at maps. And I'm running out of reasonable weekend trips. Driving to Rheinland-Pfalz, the Saarland or Baden-Württemberg to see a mountain makes no sense. And the it's unlikely that I take the whole thing serious enough to fly somewhere nearby and rent a car there. So I'm not sure what will come out of this. At the moment, it's just a collection of short trips I took. That's where it started. 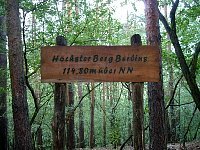 At the time I first went there, it still had the simple sign that said 'Highest mountain in Berlin'. In the years since. 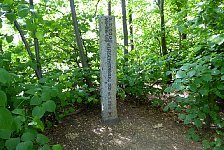 the simple info sign has been replaced by a ridiculous 'summit cross' and the inscription is now 'Highest natural mountain in Berlin'. 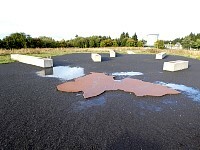 The main reason to go there was to visit Magdeburg. And I visited Magdeburg mostly because there wasn't any specific reason to select it. Places like Dresden, Leipzig or even Dessau and Meißen have some well things that come to mind when you hear the name - the Zwinger, the Frauenkirche, the Gewandhaus, Bauhaus, Junkers and porcelain. But the only thing I associated with Magdeburg was that, back when the GDR existed, passing the Magdeburg exit on the highway meant that you were nearly back in West Germany and it wouldn't take that long to get to Helmstedt. So with no idea what Magdeburg would be like, it seemed a good idea to visit Magdeburg and have a look. It turned out that the most interesting place in Magdeburg was the one I was staying at: the Grüne Zitadelle, a building designed by Friedensreich Hundertwasser, which has a somewhat unusual look and also houses a small hotel. There's also a boat tour along the Elbe river and a decent zoo in Magdeburg, but that's pretty much it. 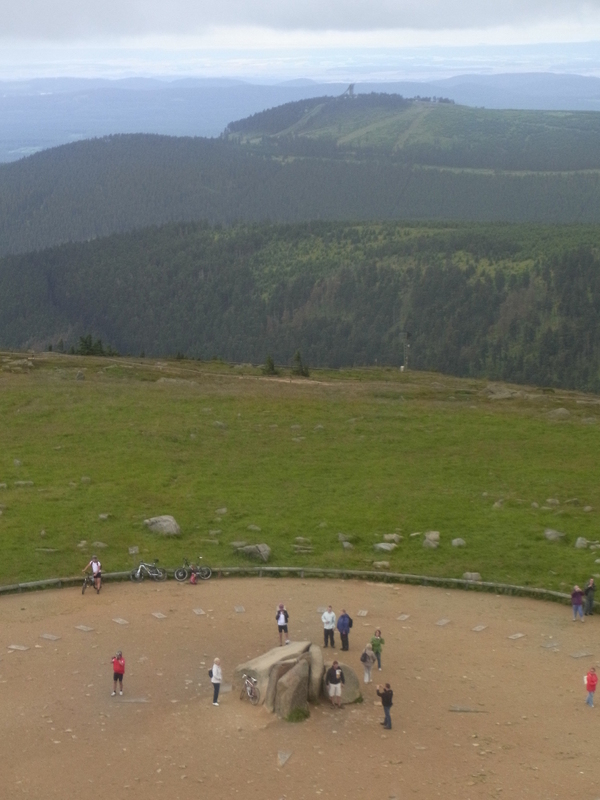 As this didn't fill the weekend, I drove on to visit the Brocken, the highest mountain in Sachsen-Anhalt. 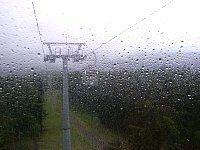 The weather was a bit mediocre when I walked up to the summit, but still mostly dry, but when I was about to head back to the car, it started to pour, so I just took the narrow gauge train back down to the car. 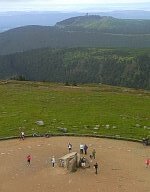 In retrospect, it would have been easier to take the train up the Brocken and then walk down, but at least that was the somewhat drier option. 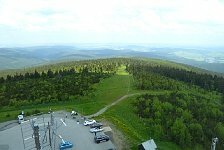 From the Brocken (see above) the highest mountain in Niedersachsen is just across the valley. 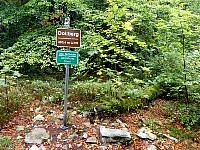 So as I was nearby anyway, I drove to a parking spot at the Wurmberg and started to walk up. 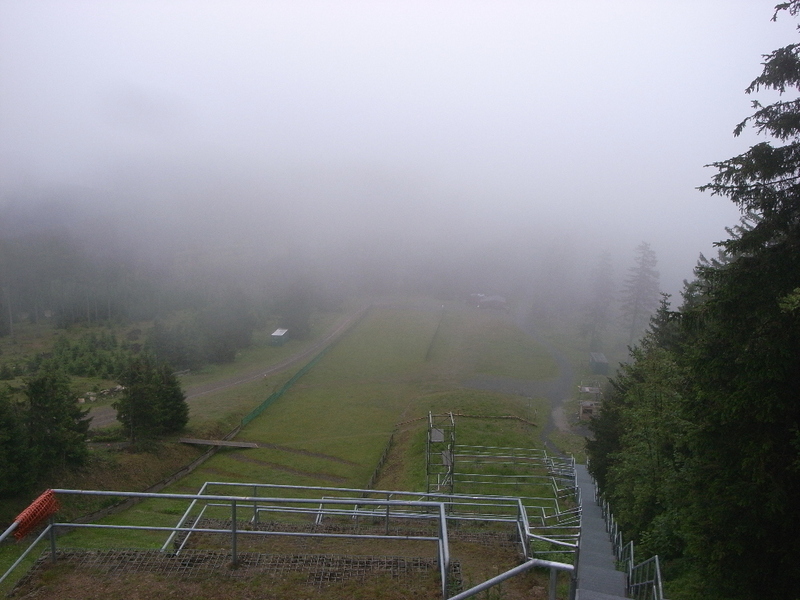 There wasn't much of a view when I got up there, since some fog had rolled in. The restaurant at the top wasn't crowded - especially in the outdoor area. So I got me a coffee and started to head back to the car. Again, it started to rain. While there's no train going down the Wurmberg, there's an aerial tramway, so I took that. Not a sensible idea - again that meant walking up and taking transport down, which is a bit inconvenient. And the valley station turned out to be lower down the hill than the place where I parked the car, so I essentially paid money to be able to do more uphill walking. Getting to the highest point in Mecklenburg-Vorpommern doesn't require much uphill walking, but is kind of dull. There is a broadcasting tower nearby and there's a wide fence around it. There's also a road leading up to the broadcasting tower. So I just drove to the parking spot next to the tower and walked along the fence (not really a path there, but at least some sort of trail) until I got around the fenced in area and to the summit marker. 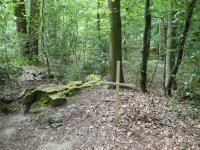 There seems to be a nicer path up to that marker (you can kind of see it behind the 'summit cross'), but that leads to another parking place closer to the foot of the hill. As the car wasn't parked there, I walked back along the trail next to the fence. 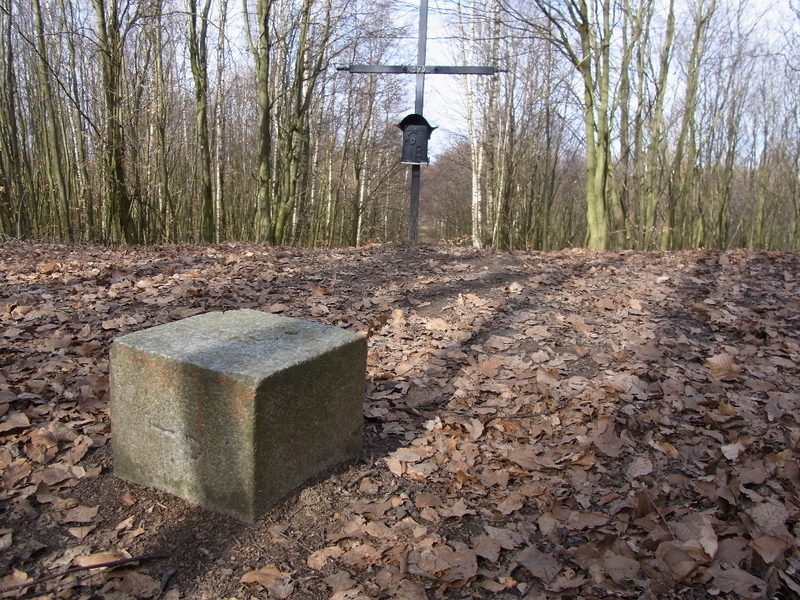 The highest point/peak in Brandenburg is one of the badly defined things again. 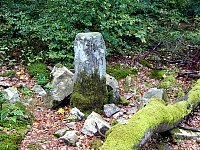 The 'Heidehöhe' is on the border of Brandenburg and Sachsen. 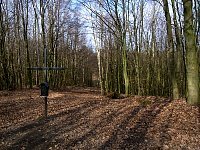 But the summit of this hill is about ten meters or so behind the border on the Sachsen side. 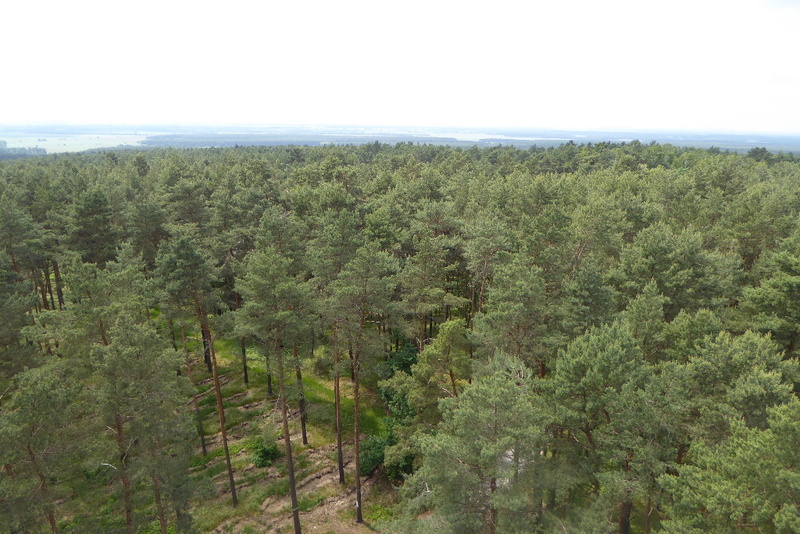 So the highest point in Brandenburg is just the highest point on the borderline, which is somewhat unsatisfying. 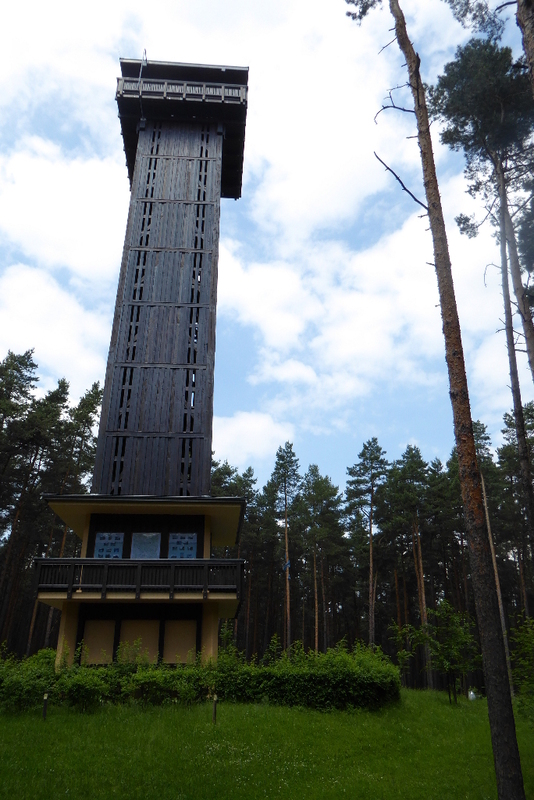 A bit further along the way (on the Brandenburg side) there's a nice observation tower that has some good views over treetops. 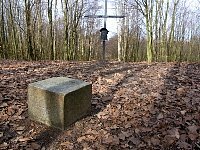 If you don't like the 'just a point on the borderline' as the highest point, the highest peak in Brandenburg is just a few kilometers away on the Kutschenberg. It's 40 centimeters lower than the highest point, but at least it's a summit. As I was in the area anyway, I visited that as well. 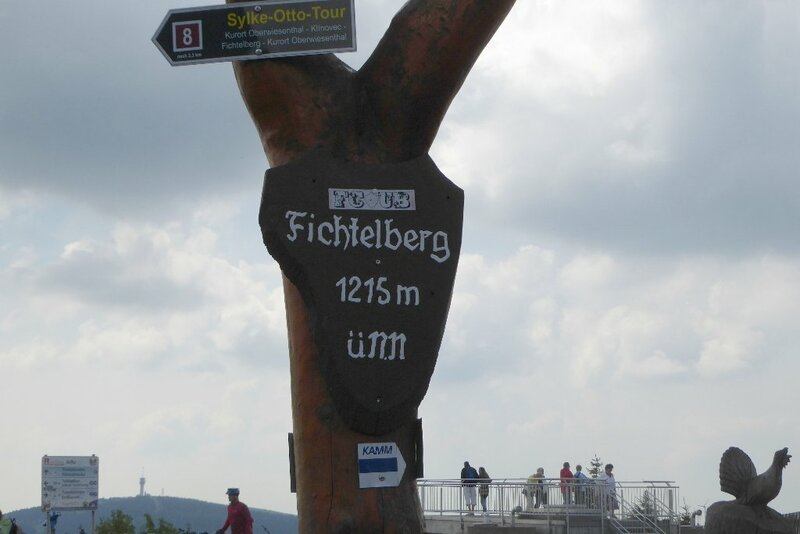 Getting to the summit of Fichtelberg was the easiest of the trips so far - you can just drive there. 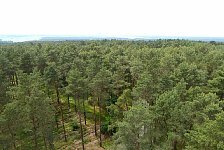 The only physical effort is to get out of the car and walk up to the top of the observation tower for a better view all around. When I got there, before noon, the weather was still nice. 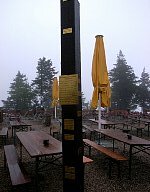 In the afternoon I went to Oberwiesenthal (the village at the bottom of the Fichtelberg), initially just to go for a snack. Then I noticed that they rent out 'Monsterrollers' there (essentially oversized kick-scooters with large wheels). 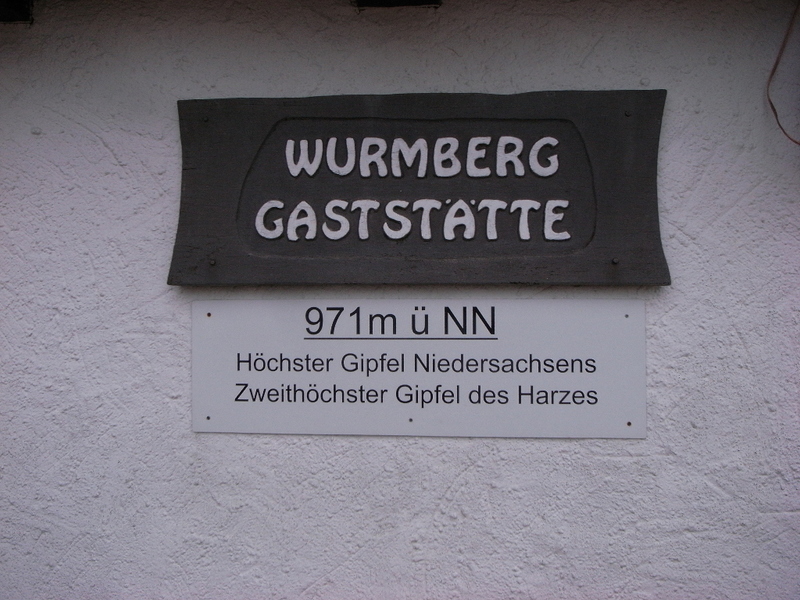 They are available at some other places (I had seen some on Wurmberg), but I've never been on one. 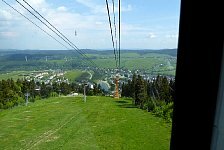 You rent the 'monster roller' at Oberwiesenthal, then ride the aerial tramway up the mountain and then it's (mostly) just running downhill back to the rental station. When riding up to the summit, the weather was still quite pleasant and there were even sunny patches. Unfortunately the grey clouds moved in quickly and by the time I was on the trail, thunder could be heard and lightning could be seen. Followed by heavy rains and, subsequently, a bit of hail as well (in June!). So while it's fun to ride a 'monster roller', there are presumably better conditions to do it in. 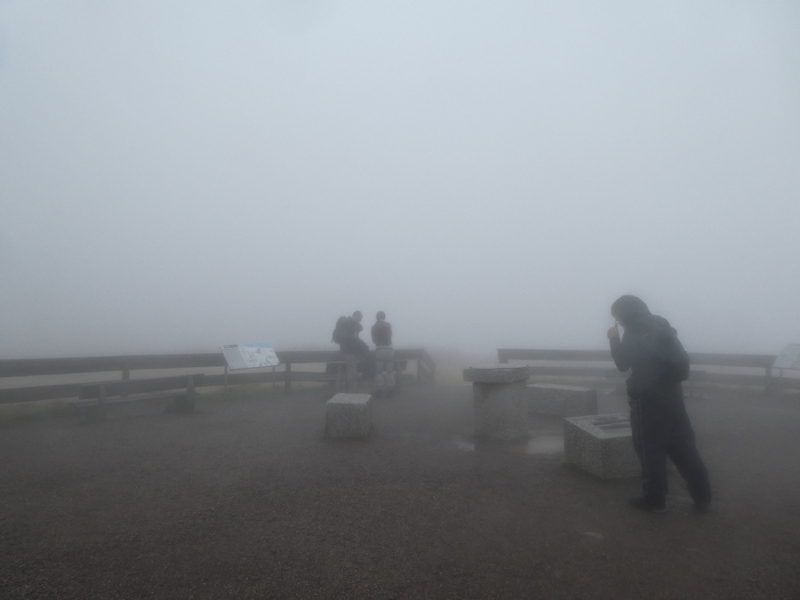 I was in Munich for a couple of days and decided to do a day tour to the highest mountain in Bavaria (which also happens to be the highest mountain in Germany). 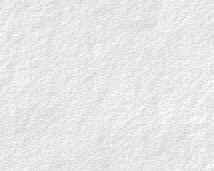 In the end, it turned out to be little more than a "checkmarking" trip. The main issue was that I had only a limited time slot to go there. It was just a single day where I had enough time for a visit there. And due to some change of plans, I didn't even have the whole day. as planned, but needed to be back in Munich in the early afternoon. 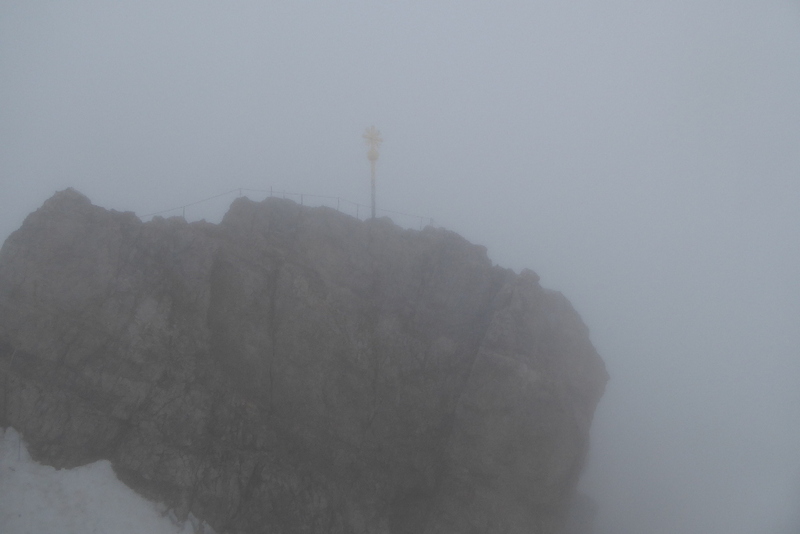 So I drove to Eibsee early in the morning, took the train up the mountain (which is a bit dull, as the last four kilometers or so are in a tunnel, so there's not much of a view) and then the final bit to the summit platform in the aerial tramway. 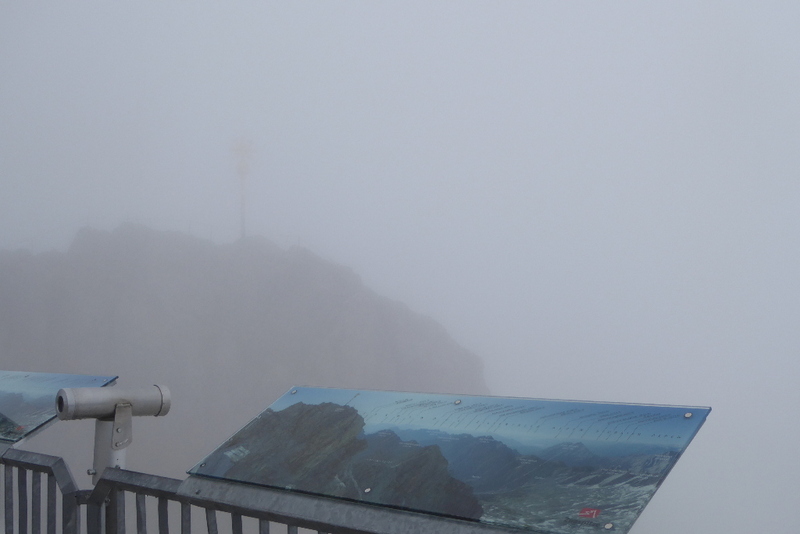 And on the Zugspitz platform, the view wasn't any better. 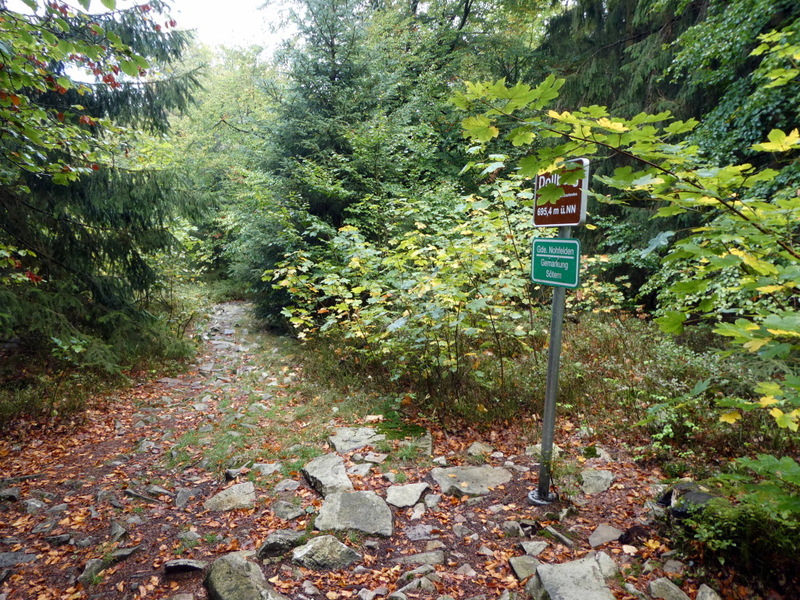 Additionally, the path to the real summit was closed. 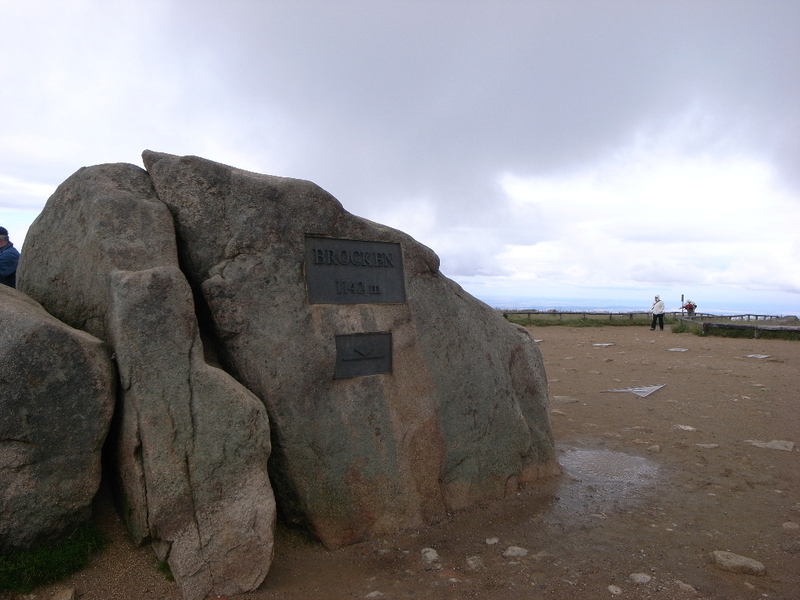 The actual summit is the one with the golden cross (visible in some of the images above) on it. 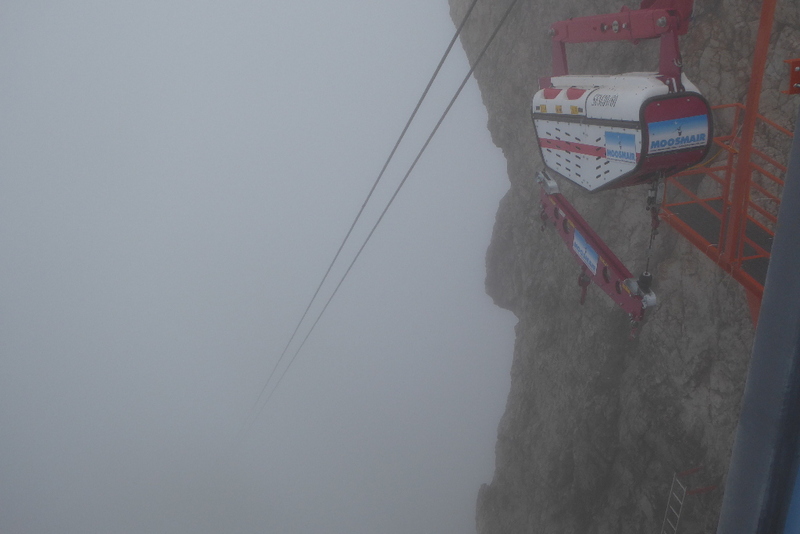 It's just a short distance away, but as there is no secured wide path with railings leading up to it, you can only go there if you wear a climbing harness and hook into the safety cable. It's not difficult to go there. 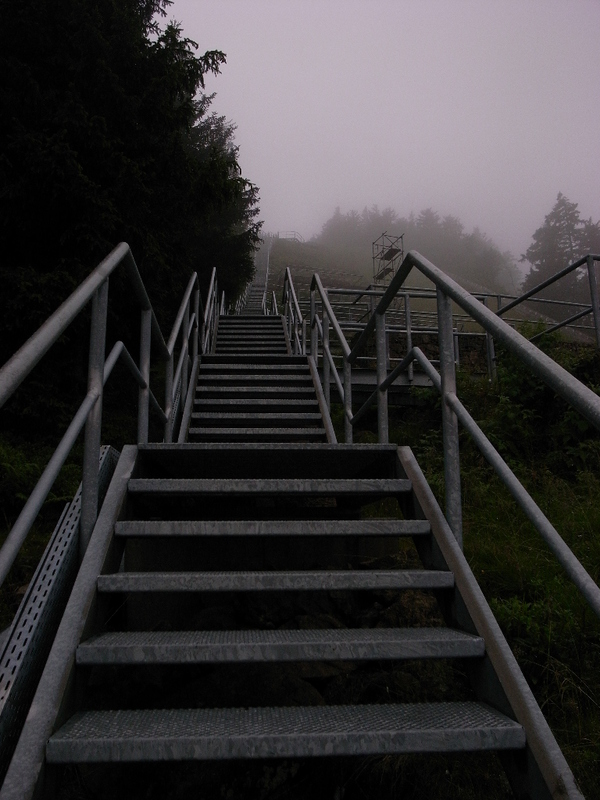 While it looks on the picture as if you would need to scale a steep rockface, there are fixed steel ladders on the side of the rock. 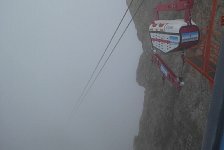 The climbing harness is just for safety, as there are some steep drops nearby. You don't need to do any climbing to get from the platform to the summit. 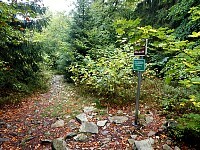 But the path access was closed, so walking over to the real summit wasn't even an option. 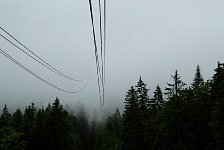 Without anything else to do and nothing to see, I took the Eibsee Cable Car back down to Eibsee and drove back to Munich from there. The cloud layer almost reached down to the Eibsee - only just before the descent finished there was a bit of a view to be had. Reaching Bremen's highest natural peak is easy. Finding it is much harder. 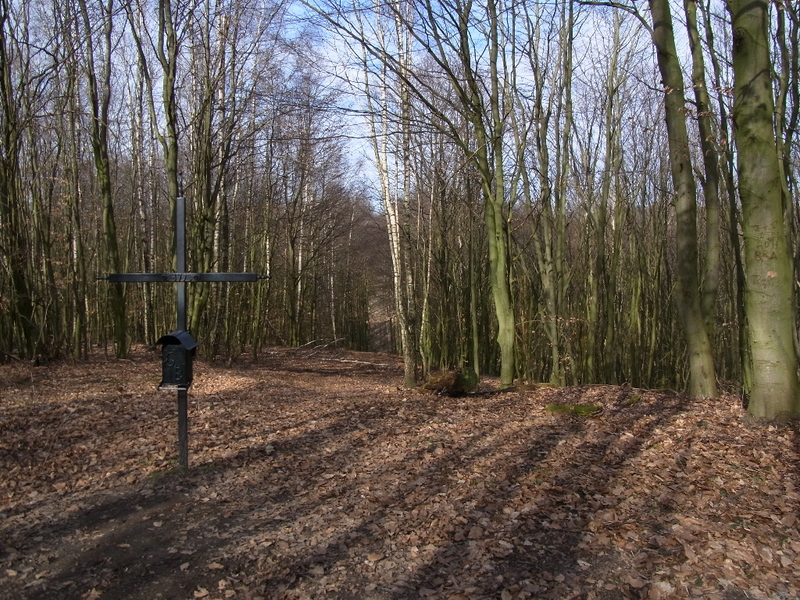 The base altitude of Bremen is at 11 meters; the highest peak is at 32.5 meters. So we're talking about roughly 20 meters height difference over the whole area of Bremen, which gives a good indication on how un-mountainous and even un-hilly the whole place is. 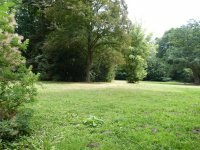 The highest point is somewhere in Friedehorstpark, which, at best, has maybe a total difference between the highest and lowest point of about a meter. 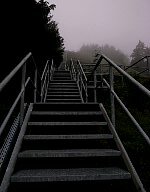 So you're more likely to stumble over the highest point than to have to climb it. 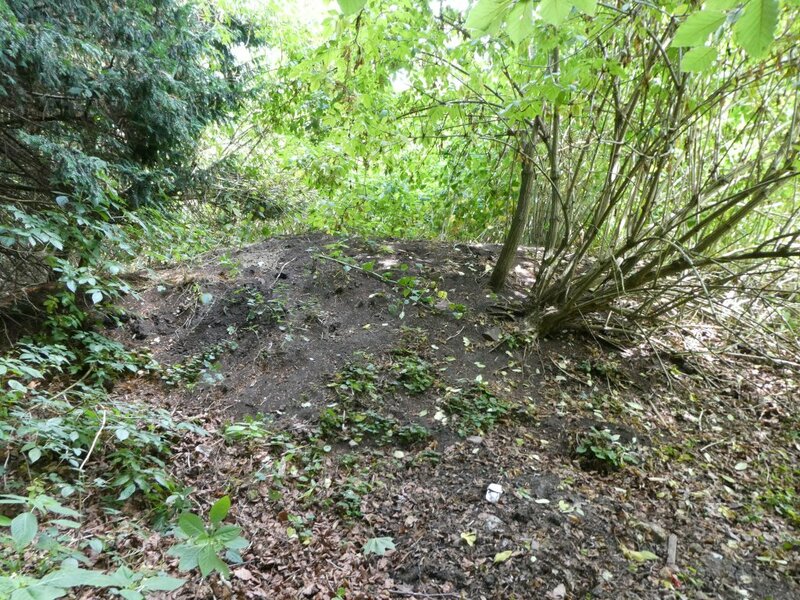 Walking around the park, the 'summit' might as well be this pile of earth. 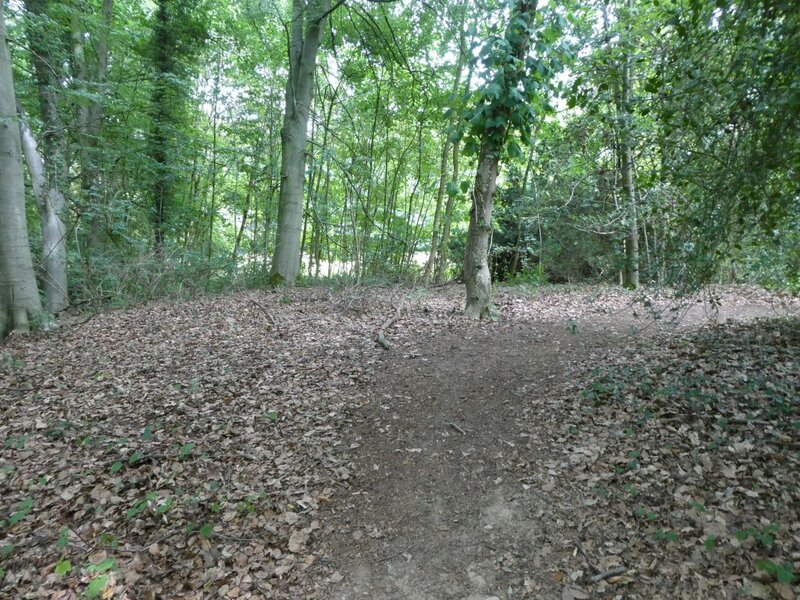 Although it might as well be this bit near a path. The GPS altitude is not exact enough to determine which one is higher, so it might be either of them. 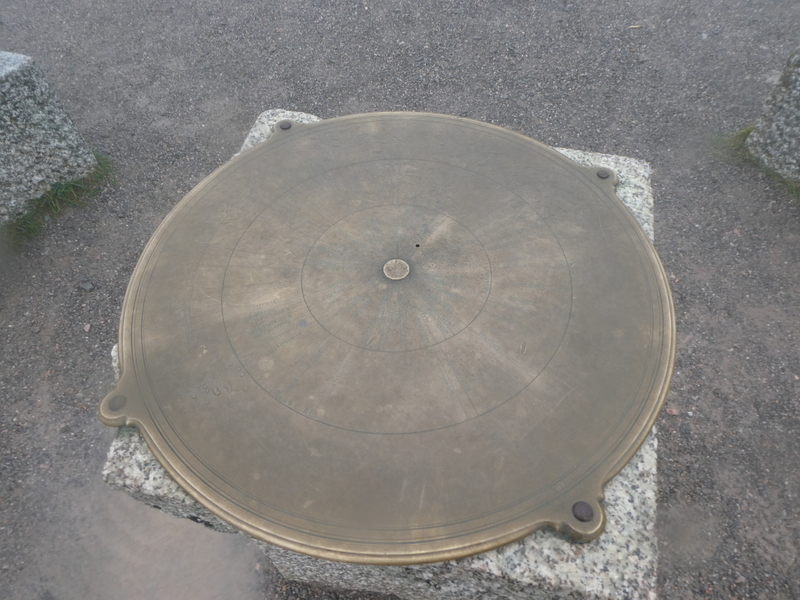 I went to all places that looked slightly elevated, so I am reasonably sure that I stood at the highest natural point in Bremen, but it is hard to tell which one it actually was. 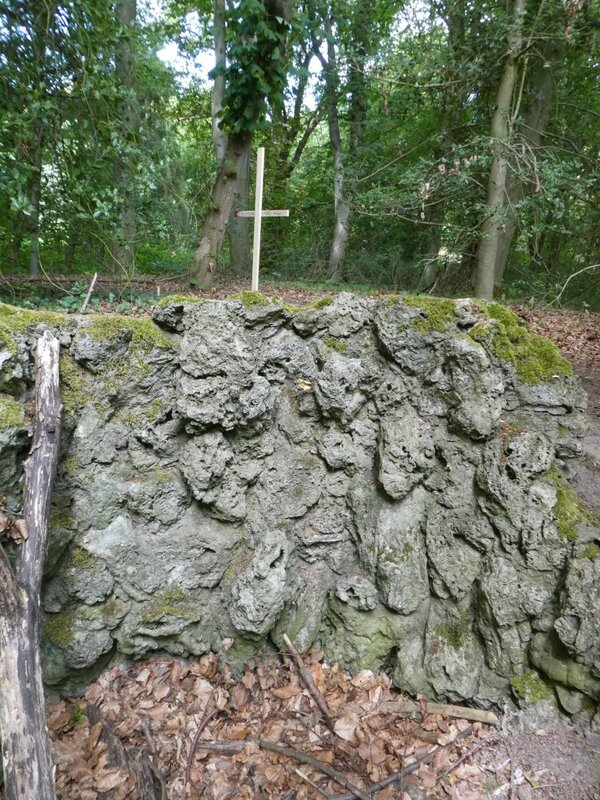 But for my convenience, someone had very recently put up a sign to mark the highest point. 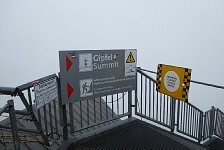 I checked the hashtag on the sign (#16Gipfel) and it turned out that the sign had just been put up two days previously. 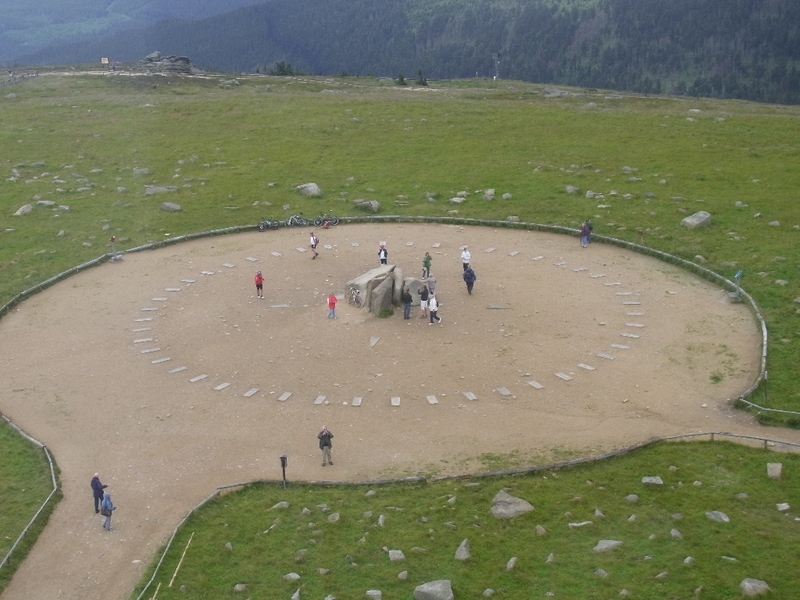 Two people were spending their summer vacation by driving through Germany and visiting the 16 summits. And as there is no real marker in Bremen, they made their own. Given the flimsiness of the marker, it probably won't survive for long, but it served me well for providing a 'proper' summit picture. It's also next to a small hole in the ground with some exposed rocks on its side, so it also provides a photo opportunity for pretending that you need to scale a nearly insurmountable cliff to be able to reach the peak. 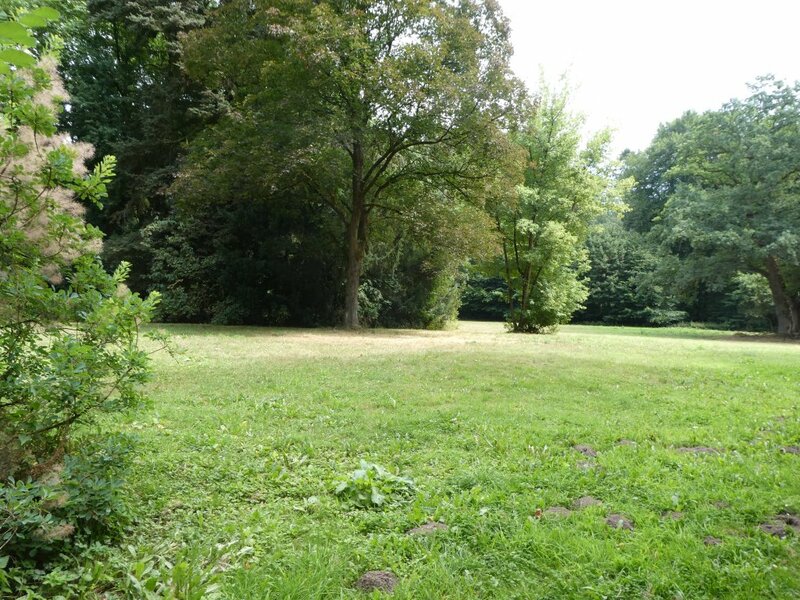 While the peak in Friedehorstpark is the highest natural geological feature in Bremen, there is a higher peak. 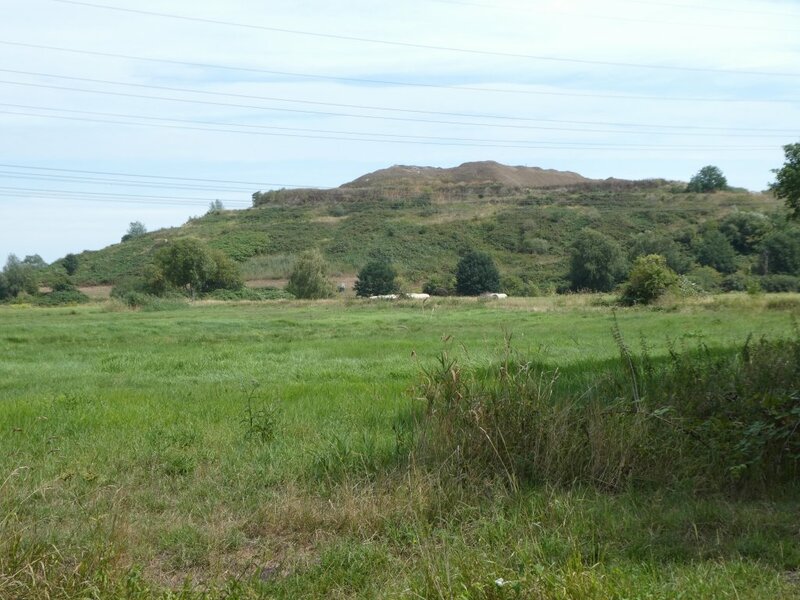 It is a garbage mountain in Bremen-Blockland. 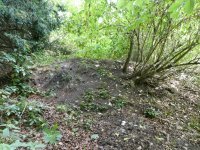 Presumably it will be landscaped at some point in the future and accessible to the public, but currently it's still being used as a garbage dump, so it is off-limits for now (and a bit smelly on a warm day as well). 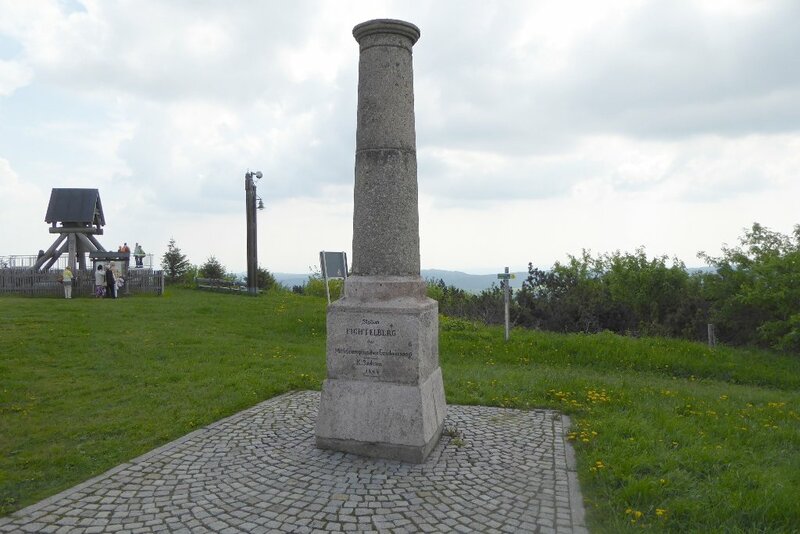 The highest point in the Saarland is, much as the one in Brandenburg, not much of a summit. 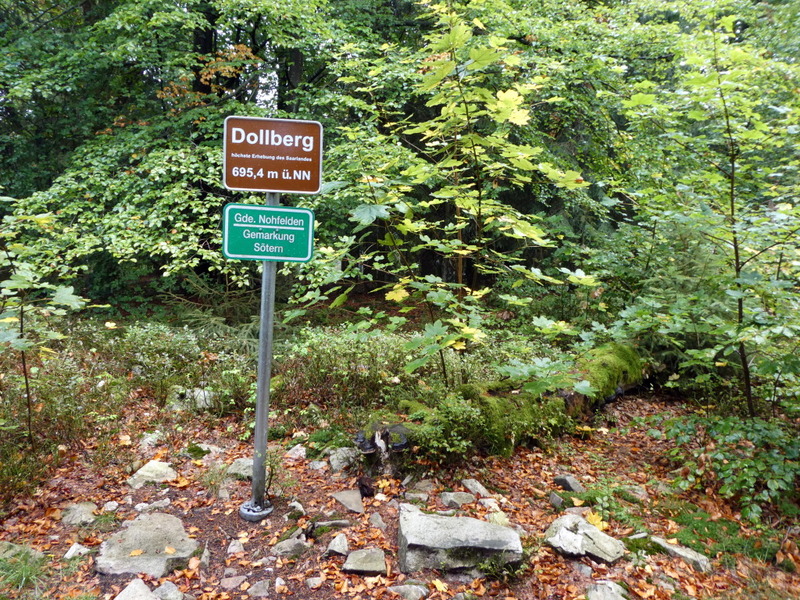 The highest point in the Saarland is on the Dollberge, but it's not the summit itself. 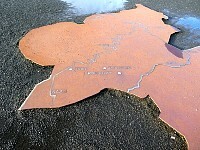 That is in Rheinland-Pfalz. 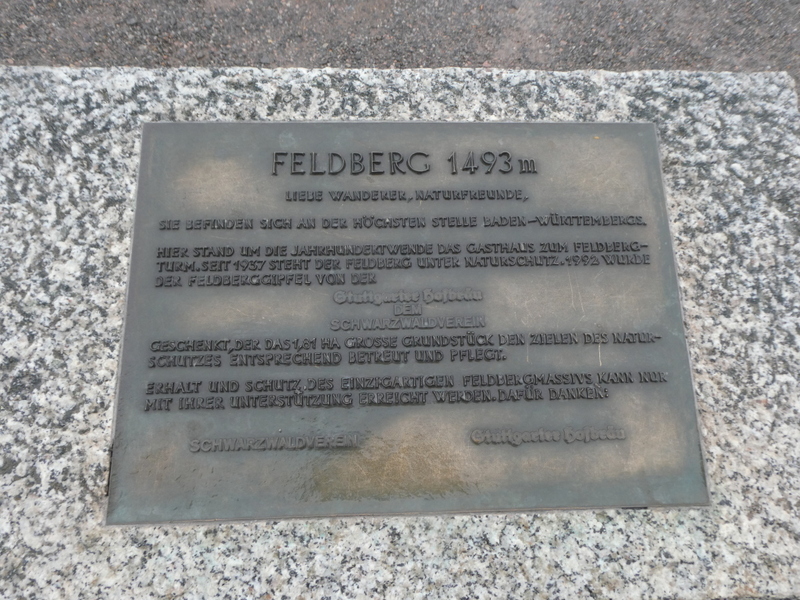 When they put in the border between Rheinland-Pfalz and the Saarland, the nearest summit (the Friedrichskopf) ended up on the Rheinland-Pfalz side. 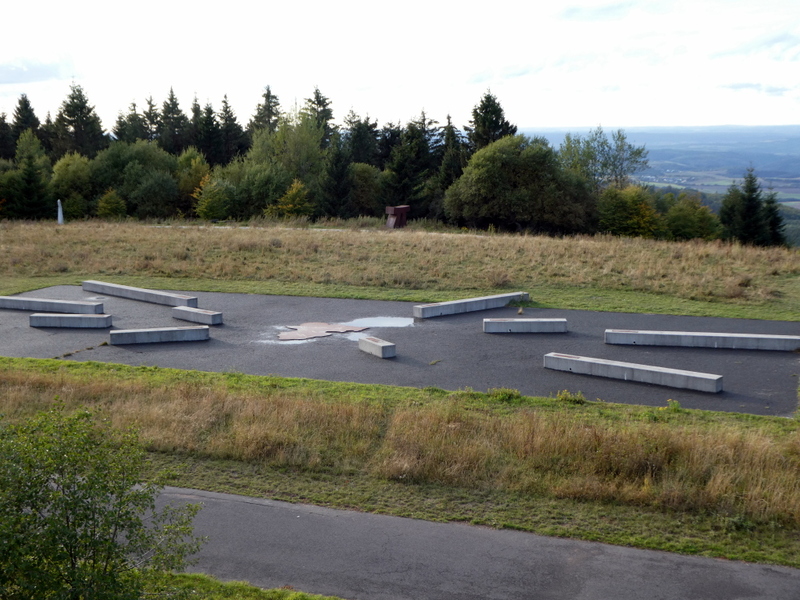 So the highest point in the Saarland is just the highest point somewhere along the border crossing the hills. 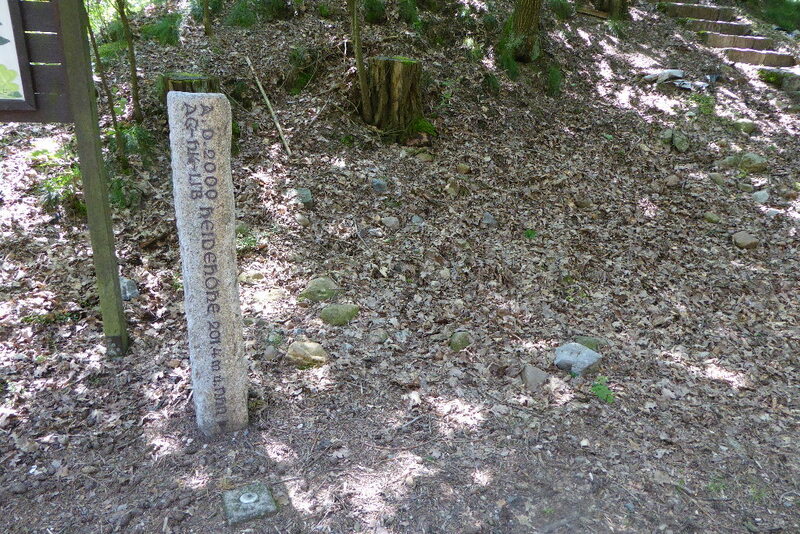 Originally there was only a border stone to mark the site (and even with that, it wasn't quite clear whether the stone really marked the highest point of the border or whether it was just one of a regular set of border stones, which just happened to be close to the highest point), but they recently put in an official sign denoting the highest place of the Saarland. So that's where I went to take a picture. 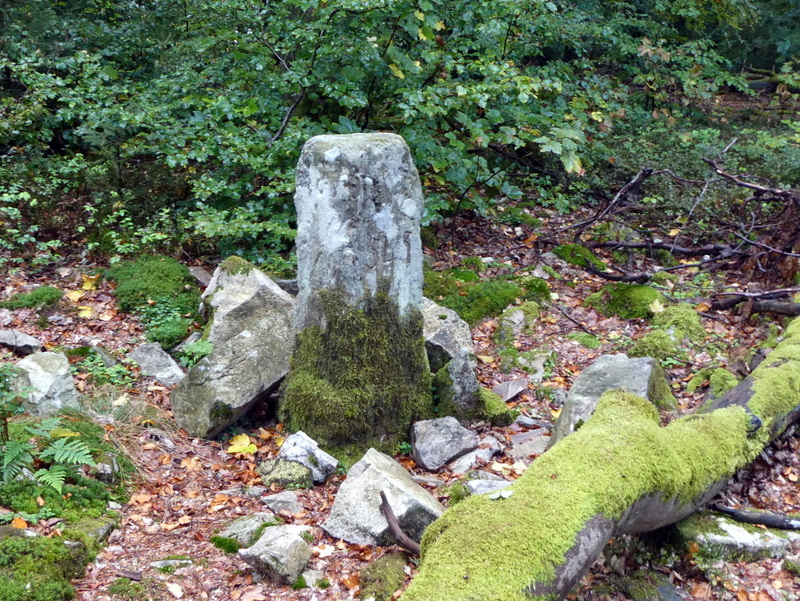 And, as I was there anyway, I took one of the border stone as well. 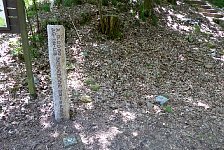 While the whole 'visiting summits' thing is pointless (and more than a bit silly...), it actually served its intended purpose this time - it helped me to decide where to go. I had a Friday off and was looking for a way to spend a long weekend. I could have had a relaxed weekend, sitting at home and doing nothing, but I decided to go somewhere instead. And I couldn't find anything interesting to visit (it was just a weekend, so long trips were not an option and all strange places to spend a night in Germany were already booked, since this was all on fairly short notice. So I decided that I might as well visit some more summits, looked for a place that would be (reasonably) convenient (as in 'just about 1100 km to drive') for some summits and booked a flight to Stuttgart. 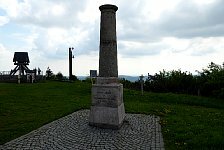 From there I went to see the highest place in the Saarland and then continued to the one in Rheinland-Pfalz and the one in Baden-Württemberg. Not necessarily the best way to spend a weekend (even though I visited a rather good tech museum in Sinsheim and a car sculpture in Stuttgart as well), but at least a busy one. 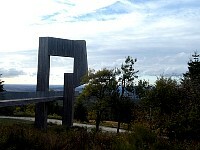 From the highest point in the Saarland, it's not far to the highest point in Rheinland-Pfalz, so I went there as well. I arrived there in the late afternoon (on a Friday) and had the place to myself (at least the public area - there was some guard at the military facility located there). 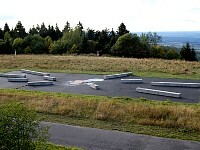 The summit marker is a metal plate in the shape of Rheinland-Pfalz with a couple of concrete blocks 'pointing' to other summits in different directions. 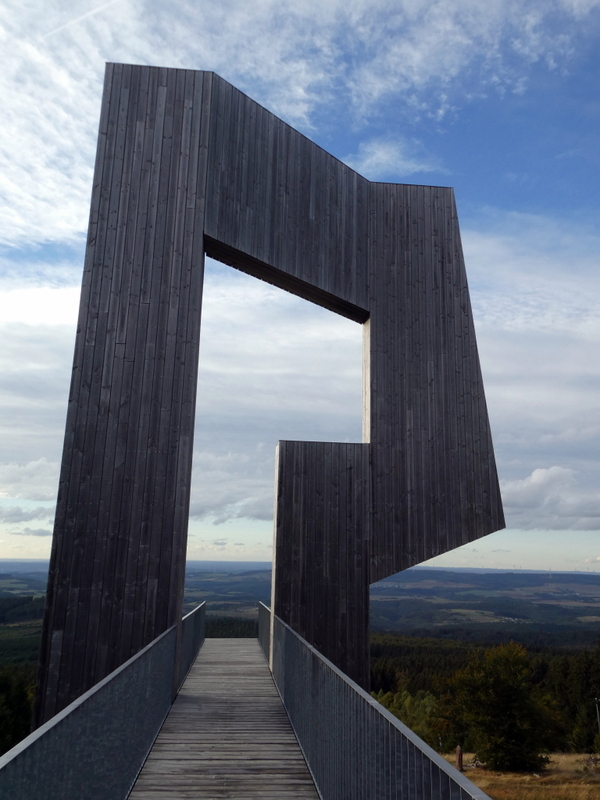 There's also an explanatory info sign, a wooden sightseeing tower and, nearby, a large wooden sculpture called "Windklang" (Windsound), even though it doesn't produce sounds, which has a small viewing balcony that provides a good view of the scenery beyond. 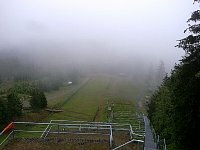 After a quick walk around the summit, I went right back to the car (you can drive all the way up to the summit) and drove on to Sinsheim. Probably the most pointless detour of them all. 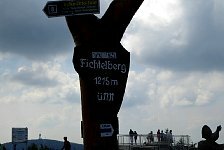 I had been staying in Sinsheim and needed to fly back from Stuttgart, so why not drive there the long way round - via the Feldberg? 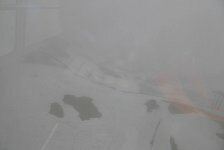 My flight was in the late afternoon, and it's about 300 km from Sinsheim down to Feldberg and then another 200 km back to Stuttgart. 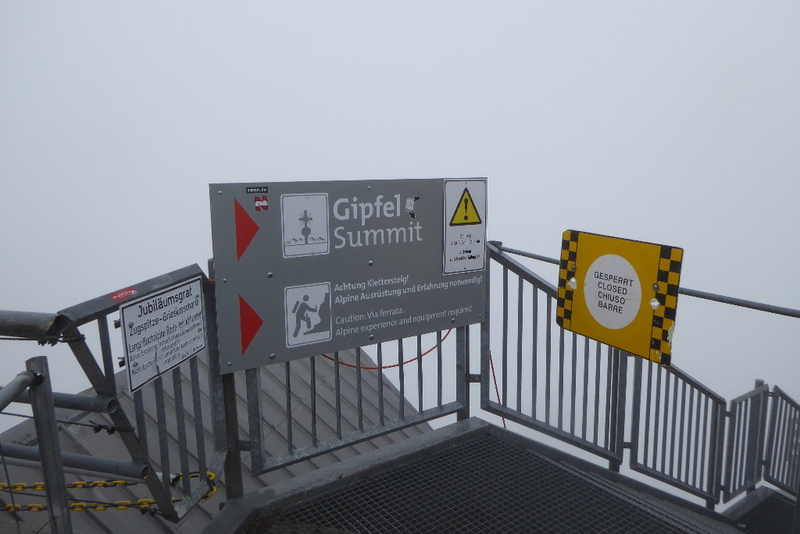 And, unlike Erbeskopf, the summit is not a drive-in. 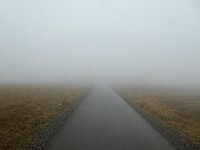 On the way, it felt increasingly pointless. It was a foggy day, so there wasn't any good view of the landscape around during the walk - and there surely wouldn't be on the summit. So all I was doing was walking to an arbitrary point in bad weather to take a picture that wouldn't show much. 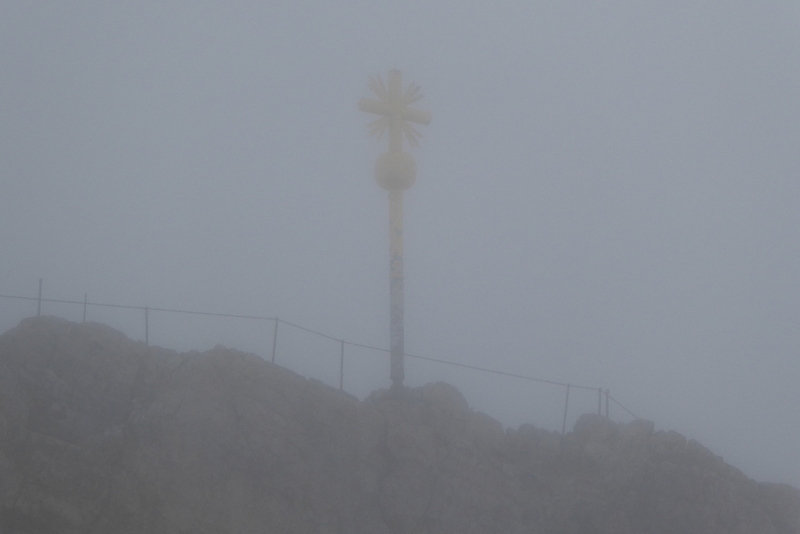 But I was enjoying myself - the way to the summit was mostly deserted (giving the amount of parking facilities at the start of the trail, the place must be quite crowded in summer) and I don't mind rainy weather that much. 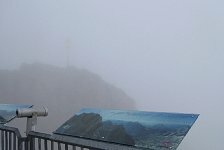 And the whole point of the exercise was to visit the summit, not to enjoy the view, so I didn't mind much that there wasn't any. 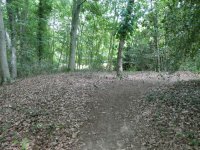 After a while of continuous uphill walking (the trail has mostly a steady slope, so there are no steep sections), I managed to reach the summit. There were three people there, so I asked one of them to take a 'summit picture'. 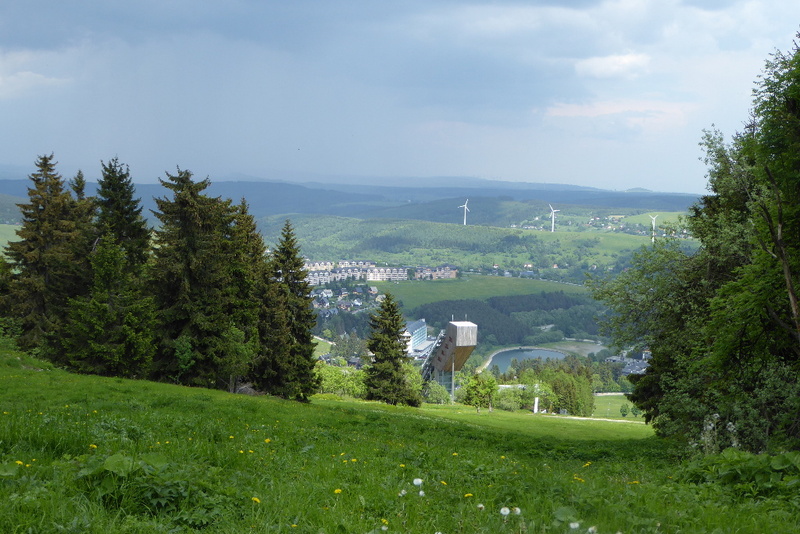 And after a quick look at the scenery, I decided it wasn't really worth sticking around (also, the wind had picked up and the drizzle had turned into sleet as well), turned around and went back to the car to drive all the way up to Stuttgart again. As already mentioned, the whole thing is a bit daft and I'm unlikely to put any real effort in visiting all 16 summits. 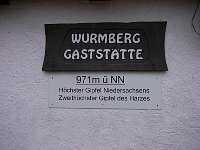 I was spending a couple of days about 40km from the highest peak of Nordrhein-Westfalen, had a car available (sort of), but didn't bother to visit the Langenberg. So it's not a high priority activity. 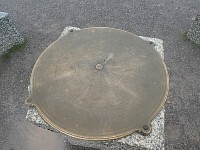 It was similar with the one in Hamburg. I did drive by reasonably close to the 'peak' (within 10 kilometers), but I needed to go on to Cuxhaven, the driving had been slower than expected, so I didn't stop to visit that summit.